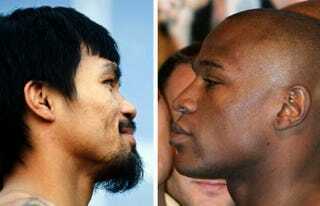 Mayweather vs. Pacquiao: Boxing’s Last Big Bout? Is this how boxing ends—not with a whimper but a bang? The May 2 bout between Floyd Mayweather and Manny Pacquiao has been six years in the making. In that time, there’s been a flirtation with retirement and a brush with the law for Mayweather, and political office and album-making for Pacquiao, while their teams hashed out the details of the purse split, drug testing and the fight location. But an agreement was made in February. Boxing’s biggest stars will finally fight, and Mayweather vs. Pacquiao is predicted to be professional boxing’s largest-grossing match. But will it also be the last fight anyone cares about? “Anyone” doesn’t include the die-hards, the fans who love boxing for boxing’s sake and will hunger for the “sweet science” long after this historic encounter. “Anyone” means casual fight fans, the American public, which used to gobble up boxing with the fervor reserved for professional football and baseball. Boxing used to be big. Bigger than two fighters. But thanks to the sport’s longtime nemesis—greedy, crooked promoters—what was once mainstream is rapidly becoming a niche sport. Before pay-per-view and HBO, boxing was accessible to everyone. Joe Louis’ bouts were national events. According to the New York Times, more than 70 million people listened to the radio broadcast of the second match between Louis and German boxer Max Schmeling—the biggest radio audience to that date for a single program. During the Great Depression, Louis represented hope and provided a needed distraction for the masses, assuaging their fears of Hilter’s rising military power by watching Louis fight Schmeling in Yankee Stadium. Louis’ bouts brought people together, around the radio and in the streets in celebration of his victories. Boxing was a reflection of the American public and its values, fighters often came from nothing to build fame and fortune with their fists—issues of race and class were dealt with in the ring, in front of an insatiable public. Legends arose from the fists of Lewis, Muhammad Ali, Jack Johnson, Rocky Marciano and Sugar Ray Robinson. The sport represented the gritty, real-life struggles of many Americans, not the glitz and bright lights of the Vegas showcases we see now. This “mega-event” factor, along with infighting among promoters, may have contributed to boxing’s slide out of mainstream popularity. Stories of crooked promoters, criminal activity and other controversies sullied a sport that seemed, at times, uninterested in cleaning up its act to better fit in the modern sports era. Promoters such as Don King became as famous for producing audacious fights as for allegedly draining athletes of money. And while the transformation of boxing into a big event fattened pockets, the expense and the exclusivity of airing major bouts only on cable and pay-per-view had the unintended effect of boxing out the casual viewer. Boxing needed big stars to justify pay-per-view matches, but big stars are made through people actually watching the fighters’ early, less lucrative matches. By making boxing rare and expensive for the average American, overrelying on the superstar factor to boost receipts, more-casual fans turned to other rambunctious pastimes to get their fix. Mixed martial arts continues to grow, and the evergreen NFL is still offering up heavy hits on free network TV and cable. Most recently, Hopkins’ wish has come true. Premiere Boxing Champions, an Al Haymon production, debuted in March on NBC television. Bob Costas, Al Michaels and Marv Albert appeared on an episode for a feature on the history of boxing in New York. Haymon, an enigmatic figure who is not known ever to have been interviewed and who is Mayweather’s current adviser, organized the production, which features music from composer Hans Zimmer. The show has been picked up by Spike, CBS, Bounce TV and ESPN. Top Rank, which represents Pacquiao, is also premiering a boxing show May 1 on Spike TV. “You are getting the matches now that people wanted to see that they weren’t able to see because different promoters didn’t come to agreements,” said Phil Greene, founder of the Future Boxing Club in Rochester, N.Y., which caters to young boxers starting at age 14. There has never been much middle ground in boxing. Either you’re among its stars, like Mayweather, being the highest-paid athlete in the world, burning money for fun, or you’re welterweight Tommy Rainone, working nights at the Hilton in the accounting department, training by day and fighting on the weekend. But as these fighters soldier on toward their paydays, big and small, is there still some fight left in boxing?